The Joint Entrance Examination (JEE) Main is an undergraduate level engineering entrance examination. It is considered as the gateway for admission into B.Tech courses in the National Institutes of Technology (NITs). In 2019, JEE Main will be held only in computer-based mode i.e. in CBT mode. The question paper will be available in multiple sets and the topper of each paper will be treated as equal performers with 100 percentile. This year, the JEE Main exam will be conducted by the National Testing Agency (NTA). Every year, more than 10 lakh students appear for the exam. 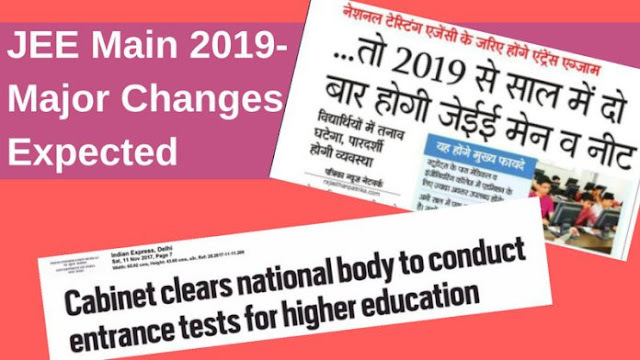 NTA is likely to introduce various changes to the JEE Main 2019. Keep reading the article to know more about the changes which are likely to occur in the JEE Main 2019. Since 2013, JEE Main was being conducted by the Central Board of Secondary Education (CBSE) in the pen-paper mode as well as in the computer-based mode. The test comprises questions from Mathematics, Physics and Chemistry. The NTA will conduct the JEE main examination in two cycles. The first cycle will be held between January 06 and 20, 2019 and the second session between April 6 and 20. JEE Main 2019 will have various sets of question papers. You must be thinking that if each paper consists of different questions, there might be grievances on the basis of the difficulty level of each set of paper. In order to solve these grievances, NTA has decided to adopt the percentile system. Now, the next question that comes to mind will be how the percentile score of a student will be obtained? So, it’s basically on the same method as in CAT i.e. the percentile of a student is obtained by dividing the number of students who scored fewer marks than with the number of students who appeared, and then multiply the ratio by 100. Since there will be multiple sets of question papers, there are chances that there will be numerous 100 percentile scorers. So, in such case, NTA will prepare the merit based on candidate’s marks first in Mathematics and then in Physics. As per statements made by the NTA official, higher score in Mathematics and that in Physics will be used as tie-breakers. The percentile will be prepared based on the normalized score in the examination and the percentile will be used for preparing the merit list. The percentile will be calculated up to seven decimal places. So, now 99.45 and 99.456 will not be considered as an equal percentile. The NTA officials also said that the multiple sets of question papers will follow the same standardization in terms of the difficulty level of questions in each set. This year, the date of the examination will be allotted randomly to the candidate. This is done to reduce student’s grievances that were made to appear in a difficult paper. The official also said that they have formulated the normalization system by analysing it in various national level entrance exams such as in the All India Institute of Medical Sciences (AIIMS) entrance test. An IIT Delhi teacher made a statement that the IITs are likely to allow the 2.5 Lakh top scorers of JEE Main to appear in the JEE Advanced 2019. However, in 2018, 2.2 Lakh top scorers of JEE Main were allowed to appear for JEE Advanced. As you can see from trends, there will be an increase in the number of B.Tech seats in all the IITs. So, the NTA’s newly proposed method of normalization appears to be a reliable model for selecting genuine and meritorious students. So, boost your preparation for JEE Main 2019. There are pretty good chances for genuine and sincere students to excel in the examination.